Let our experts take care of any problem you have with either your tracks or cables! Although the opener and the springs are probably the most important parts of your garage door system (aside from the panels, of course) they nature of such a complex mechanism is that every component has a vital role. Your door uses a system of tracks and cables to help it move in a smooth and set way, and if these parts begin to malfunction or become damaged, you'll need to have our experts quickly fix them. The smooth opening and closing of your automatic garage door are made possible thanks to the tracks that guide its path. These components are made from galvanized steel, which helps them resist rust. However, they're not always made particularly thick, which means they can sometimes get damaged somewhat easily. If a pebble gets inside them and obstructs the movement of the door rollers, or if the cables are uneven and the door starts hanging slightly on one side, the tracks may start to bend. If this issue is too severe or isn't fixed on time, the section will break. Our experts can repair bent sections and replace broken ones, and since our company stocks only top-quality replacement parts, you can count on us to use state of the art new units when this type of job is required. Our company's replacement garage door cables and tracks are made from heavy-duty galvanized steel and come in a wide variety of sizes. Once we've set the new units in place, you can expect the vertical and horizontal sections to be adjusted accurately and for the movement of your door to remain smooth and efficient. 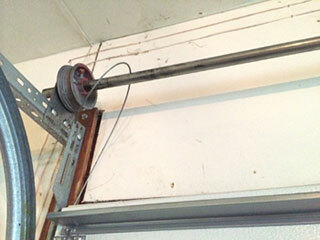 Although this isn’t a very common issue, when it happens, you won’t be able to properly open your garage door. What causes the cable to go off the drum? Typically, this type of malfunction happens when the torsion spring breaks. A great amount of force is released and the cable gets detached or tangled up. In this situation, you must not attempt to open the door as it could lead to more damages, and may even put you in danger. Our technicians will replace the spring with a new one that is durable and has a long cycle life. We’ll then adjust it accurately for optimal performance and repair the cable too or install a new one in its place, depending on whether it's become frayed or broke or is still usable. If at some point you find that your cables or tracks are experiencing some problems, give our experts at Garage Door Repair San Ramon a call and let us make sure you can quickly go back to using your system without any issues.